I was reading the local newspaper a couple of weeks ago about planned development in one of the older neighborhoods in Tampa. That's always a bitter sweet story. No one wants to lose the history but, by the same token, the area becomes so run down no one really wants to live there. Anyway, the reporter came across a vacant lot and there smack in the middle was this sight. 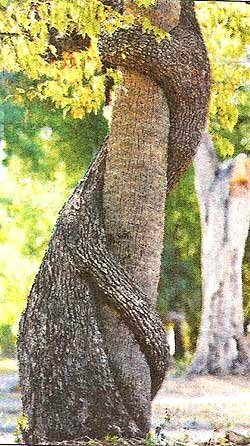 It is a palm tree with a camphor wrapped around it not once but twice, looking for all the world like a romantic embrace. The city arborist calls it "the love tree". It is very unusual -- when trees come together too closely, most of the time one will dominate and crowd out the other. In this instance, however, they grew together and essentially became one. The good news is that these trees will not be removed to make way for development. Hopefully a park will be planned so everyone can enjoy the beauty of this unique site. Happy Gardening!